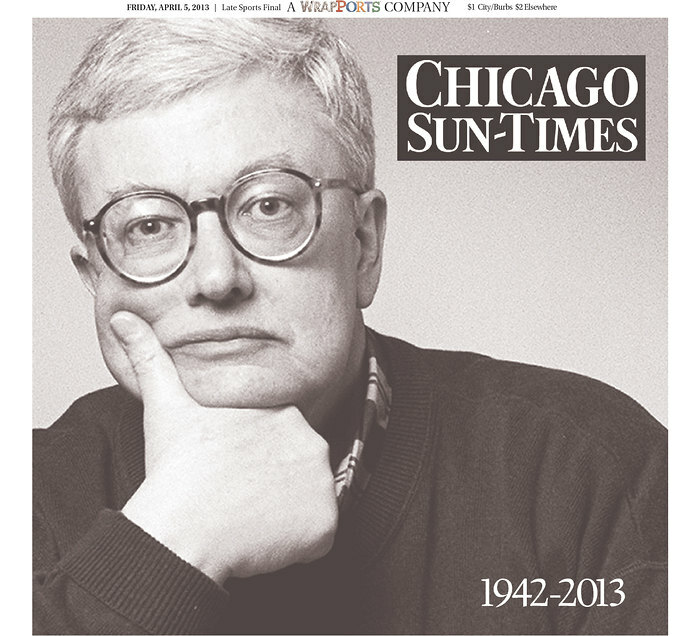 The Chicago Sun-Times’ front page today in memory of Roger Ebert. For only the second time after reading this story a year ago—two years late—I opened its link hours before Roger Ebert died, and I put it in the footnotes of Wednesday’s post on Chris Jones’ “The House of Hefner” while Roger Ebert, though slowed by his reemerging cancer, was still very much alive, explaining he wouldn’t be reviewing “as many” movies this year. I had opted to review a new Jones instead of an old—the newest—and it seemed only right to at least include a link to one of his greatest ever at the bottom of the post. Then hours later it suddenly seemed horrible and wrong, like Esquire might have felt to offer only an excerpt to the testimony of Ebert’s greatness. Here we will review that testimony, ignoring the new-writer-each-week pattern and the new-publication-each-week pattern. Another Chris Jones Esquire masterpiece. And we’ll remember Roger Ebert. Synopsis: The story was written four years after Ebert had his lower jaw mostly removed due to a vicious cancer that originated in his thyroid in 2002. Ebert cannot talk, eat or drink. To communicate he writes on Post-its, which he prefers over talking through Alex, a voice simulator with a generic American accent. He’s also one of the Chicago Sun-Times’ most loved and decorated movie critics. In most magazine writing, common structure is to open with an anecdote in the present—which in longform might last an entire section—then in the next section tell us what this story is really about, and maybe then you might begin the story’s background. In “Roger Ebert: The Essential Man,” Jones begins with a scene of Ebert reviewing a movie—“for the 281st time in the last ten months.” We don’t learn that Ebert physically is incapable of speaking, that he has fought cancer (intro blurb aside), or about any of his surgeries. We only know Ebert’s shoulders and back hurt to sit through a full-length feature film—the case for most older men—that he likes to take notes during movies, and that he and his wife “hold hands, but they don’t say anything to each other. They spend a lot of time like that”—our only hint. Still in the second section, there is no talk of cancer until its end. Because this story isn’t necessarily about cancer. In this second part of the story, Jones explains how Ebert communicates with hand signals and writing notes. Ebert tries to remember his lasts, but struggles because “it wasn’t as though he sat down, knowingly, to his last supper or last cup of coffee or to whisper a last word into Chaz’s ear.” There are talks of the doctors and surgery, but this is not the focus here, either, because this isn’t what the story is about, either. Everything this story is about is in its lead: Despite cancer and doctors and surgeries, Roger Ebert kept on as one of the best—if not the best—movie critics of his time and will likely remain so. Roger Ebert isn’t one to dwell, we learn. He just does things a little differently now. Jones’ decision to leave cancer out of the story for the first 1,500 words or so demonstrates great respect to Ebert’s showcase of these characteristics—not letting cancer define him or defeat him. It has become his life’s work, building and maintaining this massive monument to written debate—argument is encouraged, so long as it’s civil—and he spends several hours each night reclined in his chair, tending to his online oasis by lamplight. Out there, his voice is still his voice—not a reasonable facsimile of it, but his. “It is saving me,” he says through his speakers. Also noteworthy is how Jones’ anecdote of Ebert reviewing a movie is continued throughout the whole story with the rest of the day’s events, up until late at night when Chaz goes to bed, and Ebert begins to write the review. You know the cliché—“at the end of the day…” Here, at the end of the day, despite everything that has happened, Jones shows us that Ebert is who he has always been. Ebert’s adaptability, Jones’s restraint, and your story siphoning are all stunning. Rest in Peace, Mr Ebert.